Award winning Canadian songwriter Paul Kloschinsky has established a much deserved reputation as a formidable talent, but his latest full length release Nobody Knows likely pushes him onto a much brighter stage than before. Rarely are albums so unified and, yet, so difficult to pin down stylistically. Kloschinsky maintains a strong uniformity of mood and atmosphere while displaying all the characteristics of a musical chameleon, seamlessly alternating between various strains of genre without the seams ever showing. This fleet-footed facility places his work in a rare class. Kloschinsky’s recording has a distinctly low-fi ambiance, but it enhances the intimacy of the release. The ten song collection sounds like songs written in the wee hours when bleariness skews our perceptions in attention-catching, imaginative ways. “I Long For You” covers familiar territory in popular song and Kloschinsky lifts the muscular drumming straight from his rock and pop influences, but there’s an insistent acoustic pulse and attentiveness to melody throughout the song distinguishing it from run of the mill folk rock efforts. “Ravish Me” has some of the same insistent rock energy heard in earlier song, but its an even leaner aesthetic powering this song. Kloschinsky focuses on melody as much as ever and the effort rewards listeners with another memorable entry. “Sing for the Silence” is one of the more interesting tracks on Nobody Knows thanks to its subtle, yet exotic, musical turns and the droning emotiveness in Kloschinsky’s voice. Vibrant harmonica turns the album’s penultimate number, “Tell Everybody”, into a breezy pop folk rocker light on its feet and bubbling with assertive charm. Nobody Knows ends with “Xmas Time Is Near”, the album’s shortest tune by far. The amped up shuffle gains added color, like much of the material here, from the inclusion of violin. Paul Kloschinsky has released a handful of albums reaffirming the fundamental strengths of melodic and emotionally direct songwriting. He takes things a step further with his strong sense for the visual and powerful storytelling gifts. The supreme achievement of the album, however, is Kloschinsky’s ability for bringing those elements together in a completely realized musical package. Nobody Knows is his finest work yet. Paul Kloschinsky, like many of our finest talents, has largely worked off the radar as one of the best songwriters in the indie scene, but recognition is increasingly forthcoming. The laudatory critical notices continue piling up, awards are handed out, and Kloschinsky’s long pull away from the rest of the pack is closer to reality than ever with his latest release. The ten song collection Nobody Knows is anchored by some tried and true musical elements, for instance acoustic guitar and violin, but Kloschinsky’s songwriting vision extends far beyond unoriginal recreations of traditional music. He brings a number of influences to bear on the songwriting and incorporates them all into his songs with a steady, confident hand. Some might quibble with the presentation. The album’s sound has a muted, funereal quality, but while Kloschinsky’s DIY realities demand certain concessions, there’s not a single production decision affecting the material in an averse fashion. If anything, the muted sonics give the material unintentional atmospherics it might otherwise lack. The title song is an ideal example. It is a meditative effort, but there’s a mood of artful restraint surrounding the song. Kloschinsky sings like a man who knows more than he’s letting on. “Do You Remember?” has a much more studied, openly sensitive air. 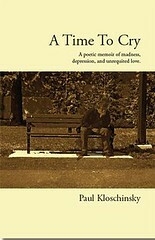 Kloschinsky’s musical skill set means he understands the ideal marriage between arrangement, melody, and lyrical content. The added bonus, however, is that Kloschinsky understands how to finish it all off with his thoughtful delivery. “I Long For You” is one of the album’s more direct songs and his condensed, tightly packed intimacy drives much of its effectiveness. Songs like this flirt with commercial influences without ever pandering for attention in any significant way. Kloschinsky spends much of his songwriting energy exploring connections to experience through his songwriting, particularly romantic entanglements, and the bluntly entitled “Ravish Me” covers much more ground than typical songs of its type. “Sing for the Silence” is certainly one of the album’s more unusual moment, practically a quasi-psychedelic acoustic turn with dreamy, elongated vocal melodies and an accompanying arrangement that achieves its effects through accumulation rather than any outright hook. “Can’t Forget About You”, however, practically demands a full fledged rock arrangement. The acoustic drive of the song has remarkable stridency for the relatively laid back nature of this album and its steady rise will prove an exhilarating listen for many. “Tell Everybody” has a vague Dylan vibe, but Kloschinsky never overplays his hand and lapses into outright mimicry. The album closes with the pleasingly layered “Xmas Time Is Near” which manages to honor the holiday it celebrates while moving listeners in a far deeper, more surprising fashion. Nobody Knows continues a string of first class releases from Paul Kloschinsky and rates as his most sustained effort yet. His efforts are accessible, yet readily surrender perhaps surprising depths to listeners willing to travel with him. This is traditional music filtered through the prism of an unique personality and certain to leave a lingering positive impression on any astute listeners. Paul Kloschinsky’s career spans five albums and the latest, Nobody Knows, brings together many of the same elements distinguishing his earlier releases. Thoughtful songwriting, solid structures, sharp instrumental talents, and a frequent emphasis on melody helped set his work apart from many contemporaries and those strengths abide on Nobody Knows. The album’s songwriting spirit, however, takes some unexpected turns along the way and they enliven an already sturdy work with a sense of daring and anything is possible desperately lacking, usually, in such releases. Kloschinsky is never a paint by numbers performer or songwriter. Even his DIY method of recording brings an unusual veneer to the work and helps weave added atmospherics where otherwise none might have existed. Kloschinsky turns everything to his uses on Nobody Knows and the result is an impressive ten song collection. He kicks the album off nicely. “Fallin’ For You” doesn’t tackle any new subject matter for popular song, but Kloschinsky pours old wine into new bottles with more than a little style and facility. He keeps his guitar playing practical and quite direct – there’s no virtuoso trips on a Paul Kloschinsky album and not a single gratuitous note to be found. The same economical artistic vision helps shape the title song into one of the album’s marquee numbers. It’s one of the album’s best examples of understatement while still carrying a discernible personal flourish that sets it far apart from similar efforts in this vein. Klonschinsky often shows a wise and knowing sense of life’s absurdities that eludes music’s more literal minded songwriters. The slow swirl of strings and light percussion married with Kloschinsky’s acoustic guitar molds “Do You Remember?” into one of the album’s finest moments. The melancholy melody never overtaxes listeners with over-familiarity and lulls you in from its opening notes. “Ravish Me” sprints out of the gate with a sprightly bounce that’s equal parts pop confection and even hints of commercial alt-rock bleeding through. There’s little question that, if he so desired, many of Kloschinsky’s songs could find new life as rock tracks and “Ravish Me” is no exception. He has a sharp ear for melody that never lets him down. “Can’t Forget About You” has a ton of propulsive energy and never relents from the first bar onward. Kloschinsky delivers an appropriately laconic vocal, but he’s attentive enough to varying his phrasing at key points for more effect. “Until You Said Goodbye” affords Kloschinsky a final opportunity to indulge his love for orchestral influenced pop music. The results are much more mixed than earlier efforts thanks to any uneasy union between the vocal delivery and lush backing track, but the song is far from irredeemable. Instead, it feels unfinished somehow, tantalizingly close to its fullest realization, but still falling just a little short of its potential. “Tell Everybody” is a nice late addition to the album thanks to its brisk pace and jaunty musical voice. Artists like Paul Kloschinsky and his songwriting sensibility is increasingly rare in these fragmented times. However, these lonely voices are still wandering the wilderness, spreading their songs, and investing their time and heart into a tradition long predating them and sure to survive them. Paul Kloschinsky is a proud member of that tradition. His songs on Nobody Knows, like the four albums preceding it, are well worth your time and money. The fifth recording from Canadian songwriter Paul Kloschinsky, Nobody Knows, is a full length release well poised to capitalize on the growing critical notice he’s received for his most recent efforts. The ten songs on his new album reaffirm his constant strengths, center on his abiding virtues, and lunge free of his comfort zone is often surprisingly frequent ways. Kloschinsky doesn’t have a virtuosic voice, but his instrument has surprising versatility that allows him to convey his own songwriting for a potentially wide spread audience. There’s an understated rock and roll spirit imbuing what can otherwise be justly labeled an artsy folk album and some of the songs could certainly substitute their acoustic guitars for Fender Telecasters with little rearranging. Like all of the best songwriting, Kloschinsky’s creations are elastic and breathe. Nobody Knows, as a whole, is an important work. It opens with the sharply paced “Fallin’ for You”. Kloschinsky certainly has thematic ground he likes to frequently cover, most often relationships between people, but he equally favors the brisker side of arranging. The opener maintains an impressive pace and scarcely gives the listener a moment to breathe. “I Long For You” is, arguably, the album’s best example of a high grand style Kloschinsky adopts on a handful of tracks trying to meld the sonic values of classical music with his stripped down acoustic arrangements. The experiment is not wholly successful, but “I Long For You” likely represents the high water mark of his attempt. Much of his songwriting efforts are confined to melodically strong but traditional fare like “Ravish Me”, but even these relatively upbeat songs embody the aforementioned idea that, with few changes at all, these tracks could work as quite impressive rock songs. One instance of Kloschinsky busting out of self-constructed boxes is “Sing for the Silence” and his songwriting sounds quite convincing in its attempt to bring his soft-pedaled acoustic textures into accord with more exotic Indian flavored fare. “Until You Said Goodbye” is a final stab at another genre hybrid, bringing together classical instrumentation with his folk song roots and the result is quite pleasing. Kloschinsky delivers a fine, understated vocal. “Tell Everybody” seems to take a nod in the direction of songwriters like Dylan and Petty, perhaps with a dash of John Prine thrown in, but Kloschinsky’s point of view is his own and the melodic virtues of the song have no clear antecedent. The album’s finale, “Xmas Time Is Near”, surely rates as one of the album’s more thoughtful songs and a wholly appropriate closer. Paul Kloschinsky’s upward trajectory continues. His songwriting covers all of the expected bases, but it’s heartening to hear someone so in command of their powers be so willing to reach beyond them and try to expand their frame of musical reference. His efforts at blending different styles on Nobody Knows are what gives it much of its merit and character. There isn’t any filler to be found among its ten songs and the album’s appeal grows with repeated listening.